Like millions of other Americans, I made the New Years Resolution to get in shape this year. I've had similar optimism in past years, but like so many others in my situation, I give up and fail at successfully following through with my goal. 80% of the New Years Resolution crowd drops off by the second week of February. This year however, I've drafted a friend to hold me accountable and help me build the habit of working out. So far? Surprisingly things are going well! While half of the battle of getting into shape is working out. The other half? Being sure to replenish your body with healthy food. In addition to a delicious protein shake, I've been adding a breakfast smoothie to my morning route. 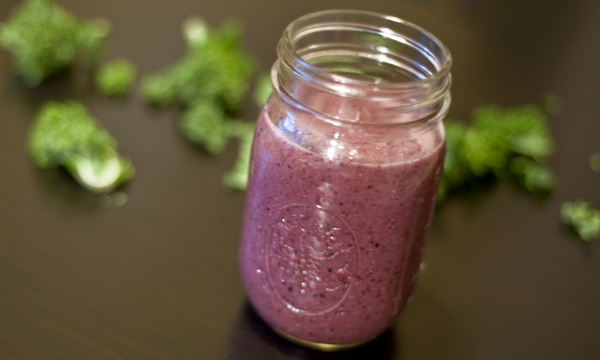 Add a few superfoods and this smoothie turns into the perfect start to your morning. Like any other recipe you come across, whether on a website or in a cookbook, don't be afraid to make adjustments based on your own tastes and preferences. Add a scoop of protein, throw in some cocoa nibs, add a mixture of kale and spinach. Place all the ingredients in a blender, and mix until smooth.